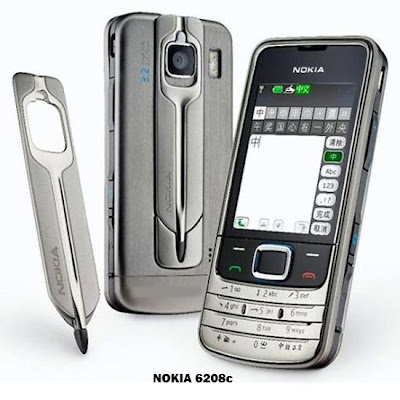 For the Asia-Pacific, particularly China, Nokia released the latest model is named Nokia 6208c. mobile phone with this unique design, including the withdrawal sword stylus that can be inserted into the glove integrates with the back of the cover body. This concept is inspired by the "Bamboo slips" which are used by residents of China as a means of writing and techniques as handicrafts from bamboo. The presence of a pen stylus strengthen this function Handwriting recognition is supported phone. Meanwhile, for the media to use touchscreen TFT display 16 million colors, resolution 240 x 320 pixels of 2.4 inch. Both media can be optimized to write Chinese characters, and a brief message more quickly and easily. Mobile phone with a cover made of stainless metal material also has some cool features. Among them strength 3.2 megapixel camera plus flash lamp, which can also be used to control video recording 15 fps with VGA resolution. For images, this camera can zoom viewfinder object of 4x digital zoom. Record the results of the camera can be stored in the memory capacity of mobile phones which have 15 MB or to insert a microSD card. Facilities for entertainment, the Nokia 6208c offers a media player and stereo FM radio. Meanwhile, for the file transfer process on the Bluetooth connection and also the data cable microUSB.